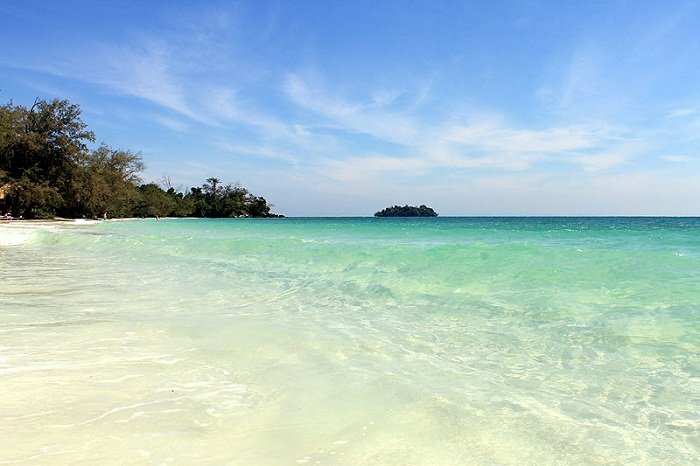 If hot and sunny weather with an abundance of small islands and beaches and to lounge upon, cheap accommodation, food, and drinks, combined with friendly locals appeals to you, make then exploring the best islands and beaches in Sihanoukville, Cambodia should be your next travel destination. The town of Sihanoukville is a province of Cambodia surrounded on three sides by the Bay of Thailand. From the beaches and surrounding hills, many of the country’s small islands can be seen and easily reached. There’s plenty to do and see here, but the main attraction is the array of sandy beaches Sihanoukville has to offer. 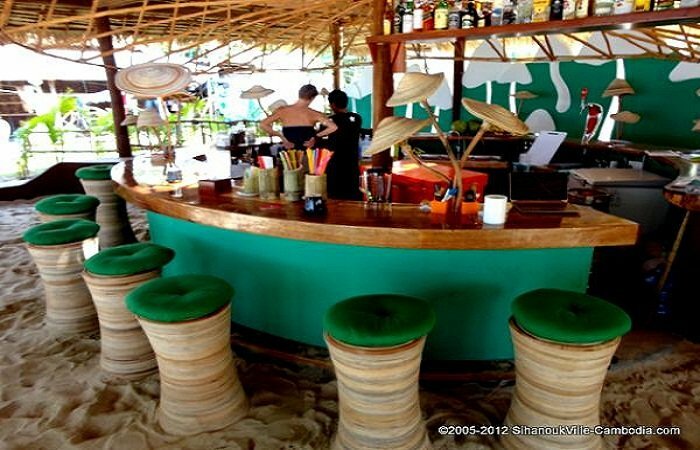 Many of the beaches have grass-hut restaurants and bars in which to fill your belly with affordable and delicious local cuisine and drinks. Once you’ve had your fill of sun, sand, and food, check out the Buddhist temples, try your hand at mountain biking or dirt biking, cool off by scuba diving or snorkelling, walk around downtown and the central market, dabble in some shopping, and emerge yourself in the Cambodian culture. You’re spoiled for choice when it comes to beaches in Sihanoukville. The beaches that line the west contour of the city from north to south are Victory Beach, Lamherkay Beach, Koh Pos Beach, Independence Beach, Sokha Beach, Serendipity Beach, Ochheuteal Beach and Otres Beach. Tourists can take water taxis to the nearby islands for diving, snorkeling, and game fishing. The northern section has become known as Serendipity Beach and is a popular beach with western tourists, noted for small guesthouse rooms right on the beach. Aside from the guest houses on the beach, there are around 30 beach huts serving good value meals and a wide selection of drinks. Beyond a small headland at the south end of Ochheuteal is Otres Beach, which is far less developed but is well-known for its long stretch of clean, white sands, making it a great spot for sunbathing and exploring. Otres Beach is the quietest beach in Sihanoukville, so retreat here if you want to relax and get away from the hustle and bustle of the city. 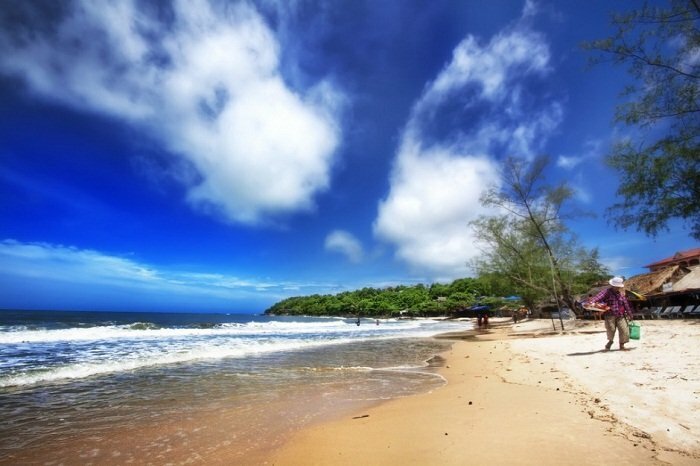 Victory beach is situated at the furthest north of the peninsula of Sihanoukville. It was the original backpacker beach and is still popular with budget travelers. The deep sea port is found at the northern end of the beach. 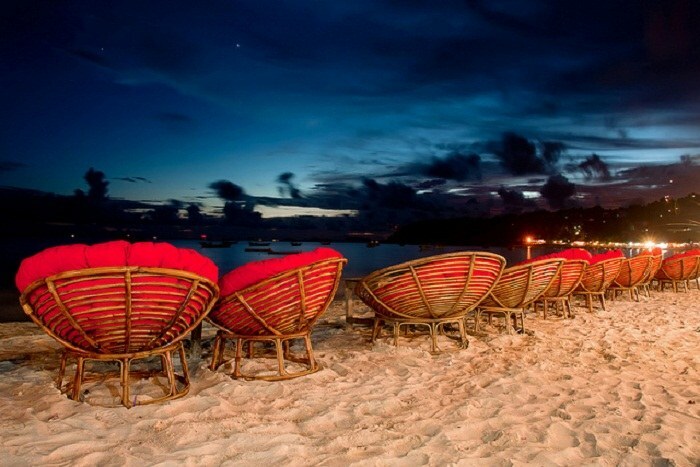 Apart from white sand and blue sea, this beach offers a perfect spot to enjoy the sunset. There are more than a dozen islands off the coast of Sihanoukville for tourists to hop around and explore. Only a select few of them have been developed for overnight stays, and many guesthouses, travel agencies and restaurants on Ochheuteal and Serendipity beaches offer trips and packages to a handful of these islands. Koh Russei, also known as the Bamboo Island, is a medium sized island located a few kilometers out from Otres Beach. There is a small navy base located here, and some beach bungalows to stay overnight in. Koh Rong Island is situated west of the Sihanoukville coast. It offers a fantastic strand of beach on its southwest coast, stretching about 5 kilometres. It has fresh water resources on the island and a bustling fishing community on the southeast which makes it a prime spot for sourcing fresh seafood. Koh Rong Samloem Island is slightly smaller than Koh Rong and situated on its south. Beautiful beaches are on the east coast, where a large heart-shaped bay with some shellfish cultivation is located. The marine life around Koh Rong Samloem is very diverse and is a great spot for scuba diving or snorkelling. Koh Tang Island is located a fair distance from the main shoreline of Sihanoukville, requiring travellers to stay onboard overnight. 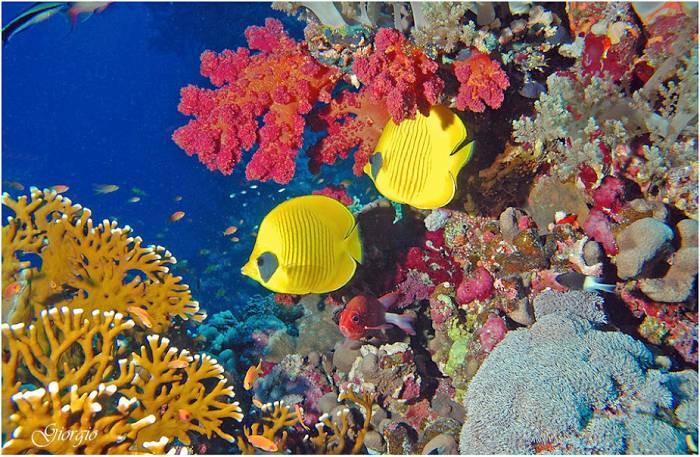 It offers interesting diving spots – most of which are not frequently explored. The island is home to a military outpost and boat travelers should expect to be boarded by military personnel when travelling out at the island. Koh Pos, also known as Morakot Island or Snake Island, is located 800 metres from Victory Beach. It is under development by Russian investors to become a luxury holiday destination. It was linked to the mainland with a bridge in July 2011, but the bridge is not currently open for traffic. 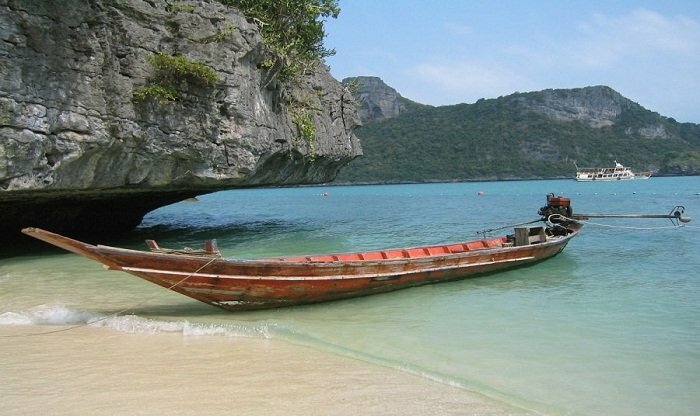 Koh Dek Koul is a small private island 7 kilometres from Victory Beach. 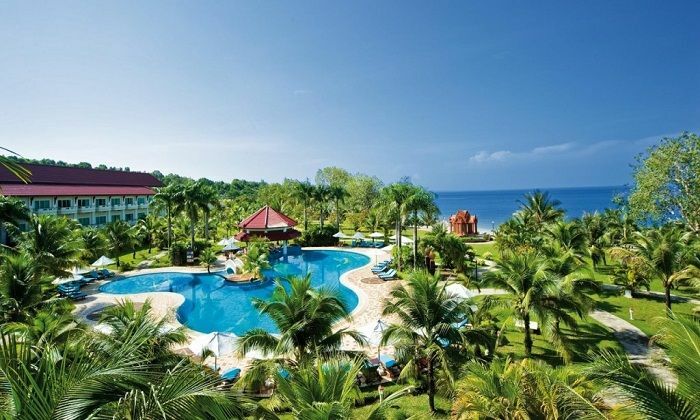 The luxurious Russian-owned Mirax Resort is located on this island, which is a great option for travellers to Sihanoukville who wouldn’t mind splurging a little. Small long-tail boats and medium size cruising boats can be hired for sightseeing, fishing, diving, and drinking trips at most beaches in Sihanoukville. Bookings can be made through guesthouses, travel agencies and diving operators. Streets in Sihanoukville downtown are mostly in good condition but enforcement of international norms is poor. There’s an overabundance of motorbikes due to the lack of public transportation, and the city is considered unsafe for driving. Drivers of motorbikes don’t tend to use helmets, mirrors are rarely used, and it is common to see motorbikes with more than two passengers. The city doesn’t have a public transportation system, so there’s an informal urban transportation system of motor-taxis and tuk-tuks to help people to get around. This isn’t controlled by authorities, and anybody can become a motor-taxi or tuk-tuk driver in Sihanoukville. Bearing this in mind, there’s no price control of services so travellers should confirm prices before using any of these services. It also pays to ask advice from tourist agencies and hotels. 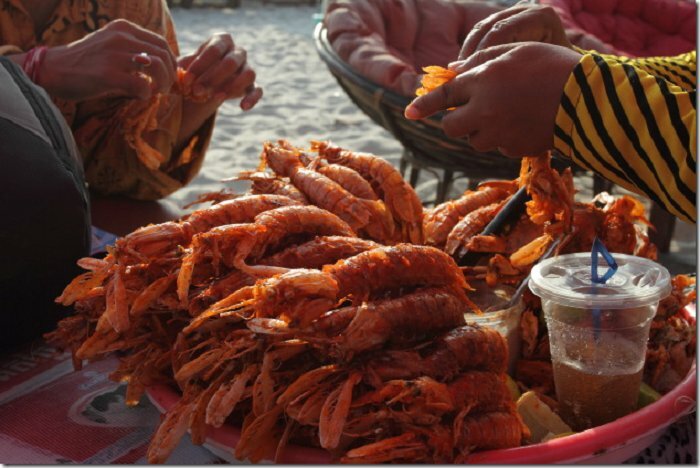 With the ocean easily accessible in Sihanoukville, there’s no shortage of fresh seafood to be found. All the beaches have seafood restaurants and downtown has a nice selection, but if seafood isn’t your thing you have plenty of other options to tempt your palette. A dollar gets you a meal and a drink at many of the small Cambodian restaurants on the street, so dining out certainly won’t put a hole in your wallet here. Sihanoukville is also the location for the main production plant of Cambodia’s national beer, Angkor Beer, which is worth a try while in the area. A few of the islands off the coast of Sihanoukville have rooms (or a hammock) from $2 USD to $3,000 USD a night. Most of the rooms are beachside bungalows which are normally around $5 to $50 USD a night. The more you pay the better the amenities and the location become. The best time to visit Sihanoukville is between the beginning of November and the end of February as the weather is cooler but sunny. Low season is between the begining of July until the end of October due to heavy rain. March to June starts to get hotter and more humid without too much rain, and October sees a little rain everyday which helps to cool things down. From Thailand, just fly from Bangkok to Phnom Penh (about a 45 minute flight), then take the five hour ride by taxi or bus to Sihanoukville. Travel by bus or car from Koh Kong, at the South-Eastern Thai border near Trat, to Sihanoukville, which takes about four hours. The Sihanoukville International Airport is located 18 kilometres away from Sihanoukville downtown, along the NR4.